It was pouring rain all weekend so as the wedding celebration of Jai and Nakhil came closer we became pretty nervous about the ceremony since it was outside and the couple wasn’t sure how they’d handle the large group. Luckily, the beautiful landscape at the Cranbrook Mansion in Bloomfield Hills brought out the tents and camopies even right next to their fountains and patios. I came prepared with my typical 14 umbrellas but much to our surprise the sun came out and the weather turned very quickly right as the bride and groom were announced; no joke, we never needed to be that resourceful but we were ready for it! Cranbrook is an amazing location for weddings and all the details at the Cranbrook Mansion is a perfect fit for Hindu Indian Wedding Pictures. After the ceremony we wandered around to explore the beautiful location with saturated color from the clear sky and recent rain. While Jai was getting ready, Nakhil celebrated his Baraat in the rain. The brightly colored umbrellas were so much prettier than the ones I brought with their brightly colored outfits… what a GREAT event! 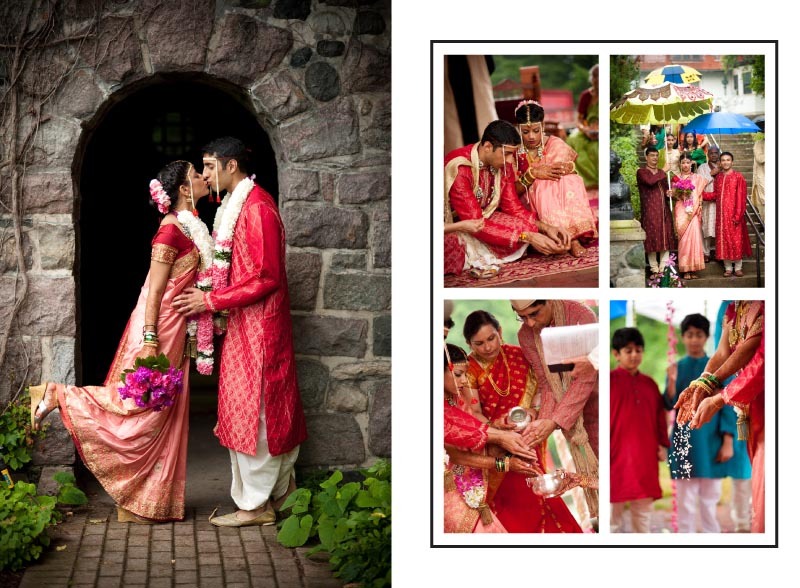 Indian Wedding Ceremonies are always a very close and intimate gathering of a large group of friends and family. It’s hard to believe something can be both large and intimate but it’s absolutely something I love about all types of Indian weddings. While the couple was being showered with rice, the rain was still POUNDING down but within 5 minutes the rain stopped and allowed the couple to walk out of the canopy without an umbrella. This is one of the reasons I love doing destination weddings and traveling away from home to shoot; there’s no place in Grand Rapids like the beautiful Cranbrook academy. Even better is going from a great place like Cranbrook in Bloomfield Hills to a beautiful modern location like Twin Lakes Golf & Swim Club in Oakland. This reception was very different from most Indian receptions starting when Jai sang a poignant song to her groom but ended up just as big and amazing as every other with thumping music and a GIANT celebration where everyone was involved. Linda Radin - Exquisite!! Need I say more. Alina - Its interesting seeing weddings of different cultures! You certainly got amazing shots of the wedding!